See this article on how to scratch build a diesel fuel storage tank in the May edition of Model Railroad Hobbyist magazine at: http://issuu.com/mr-hobbyist/docs/mrh12-05-may2012-ol?viewMode=presentation&mode=embed. The Chesapeake, Wheeling and Erie Railroad finally held its first ever operating session, and it was a blast! Good friends Stuart Thayer, who has been instrumental in developing the operating scheme on the layout, and Jim Rollwage (you can see Jim's beautiful Denver Pacific layout on YouTube here: http://www.youtube.com/watch?v=VMUCKyocX-4) came over and Stuart brought Anthony Hardy with him from Lexington. 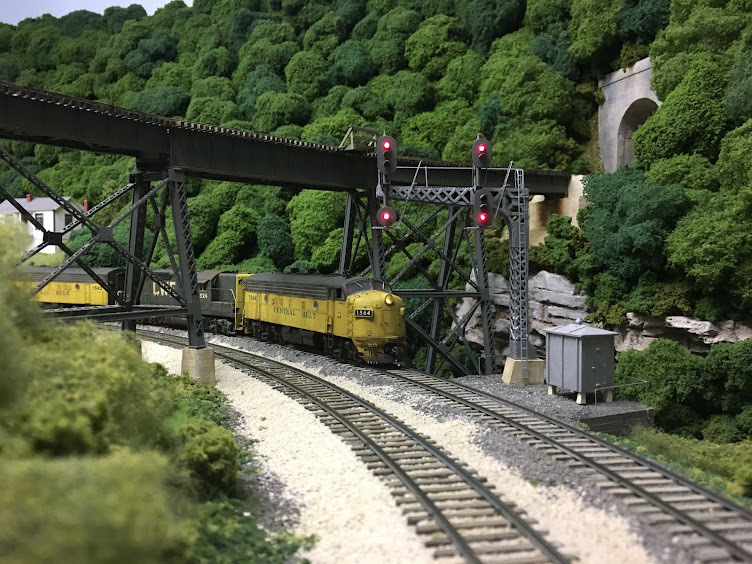 Stuart and Jim have been involved in operations for over 30 years, and Anthony's layout appeared in the 2003 edition of Model Railroad Planning. Given the level of knowledge and experience of the group, I was a bit nervous to say the least. All in all, though, the session went fairly smoothly. The layout currently has only one staging yard in operation, so the plan was to run six trains: 1) Way freight Train 304 (staging to the yard at North Pierce); 2) COXE 42- coal empties from staging to North Pierce; 3) The Big Chimney Roustabout (local from North Pierce to Big Chimney, WV and back; 4) Sand Fork Mine Run (empties from North Pierce to the tipples on the Sand Fork Branch and loads back to North Pierce); 5) Way freight Train 205 (North Pierce to staging); and, 6) COXL 51- coal loads from North Pierce to staging. I served as yardmaster/dispatcher and we used track warrants for train movements. The session took about 2 1/2 hours, and everybody appeared to enjoy themselves. As expected, the gremlins showed up and almost wrecked the session before it even started. The morning of the session I turned on the layout only to get a short buzzer from the CVP Zone Master at North Pierce. I spent the next two hours tracking down the short, which resulted from the closing of a gap at the frog on one of the turnouts in Hollister Yard. On visual inspection it appeared to be o.k., but once I re-cut the gap everything was fine. Once the session got started, the two old Atlas switches at the entrance to staging acted up, shorting when the six axle diesels crossed them. They have both been torn out and are being replaced with hand-laid turnouts. And the two commercial switches on the main at either end of Big Chimney acted up. The closure rail on the curved turnout at the west end wouldn't stay in gauge (I spent two hours the previous day trying to fix the power in the frog on this turnout) and the turnout at the east end shorted when diesels took the diverging route. Both of these switches will be replaced with hand-laid turnouts before the next session. The rest of the layout performed very well, and I was pleased that there weren't more issues. This was only the second time that I have ever operated on a layout, and I quickly realized what I've been missing. It was even more fun than I anticipated and I can't wait until the next session. And I've got to thank Stuart for getting me an invitation to operate on Jim's layout. That was the first time for operations for me, and Stuart and Jim couldn't have been more patient and helpful. Talk about a great introduction into another aspect of this amazing hobby! And there will be photos to post from the next session.